Now that I know my 1948 Willys CJ-2A runs, my biggest issue—one that threatens to cripple the whole project—is the electrical system. Namely, the fact that two critical components, the starter and generator, are toast. The electrical system on a 1948 Willys is about as simple as they come—my friends and I could rig something up in a night, no problem. 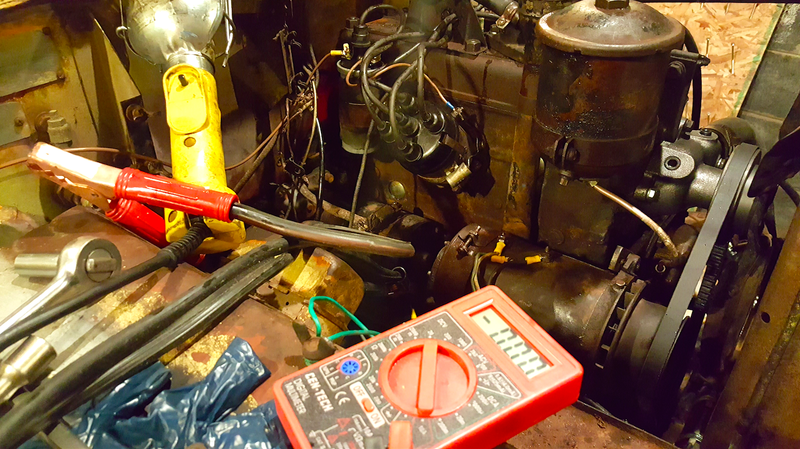 What is a problem, though, is the fact that key parts of my Willys’s electrical architecture just don’t work, namely the generator and starter. You might recall that my brother and I attempted to rebuild the generator. It was actually very straightforward, as there’s really not much to the thing. But we didn’t really do a full rebuild, electing to keep the original windings. Sadly, after taking the “refreshed” generator to the shop, I learned that there’s a short in there. Seeing as my brother and I were very careful to insulate everything properly, I think there’s an internal short in the field coils. What’s worse is that it looks like my starter motor gave up the ghost. It cranked my engine over just fine the other night, but now it won’t turn over at all, and I’m beginning to think I overheated it by cranking it too long—in retrospect, we should have treated that starter with a little more respect, because it’s 69 years old and replacements are very expensive. With the plugs out, the motor spins the engine just fine. But as soon as it has to fight against compression, she just doesn’t have enough grunt. I’ve bypassed the wiring by using jumper cables, but that didn’t help either, so I’m fairly sure some of the motor internals are friend. I’ll double check by running to a starter and alternator shop, but it ain’t looking good. Sadly, unlike last year’s project, the starter and generator are two major issues. With last year’s Cherokee, I could just run to the junkyard with 50 bucks in my pocket, and come back with a perfectly functional starter and alternator. But with a 1948 Willys, I can expect to pay a lot more this time. I’m hustling around to find used parts that work, and I’ll get some price quotes from the shop to see how much it’ll cost to rebuild these things, but man, this is a significant problem this late in the game. Project Slow Devil, A Project Or A Tragedy?